I buy my eggs at a local feed store that sells local farmer’s eggs. 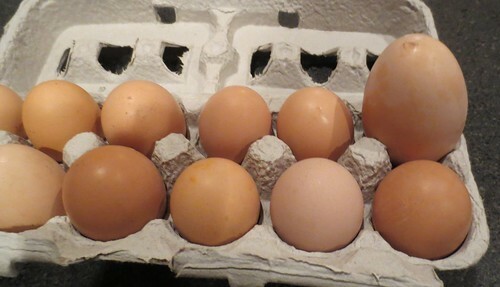 This week I was shown this incredibly large egg in a box of chicken eggs for sale. Check out this amazing egg in this dozen. I was told this egg was laid by a Barred Rocks chicken which is also known as a Plymouth Rock chicken. 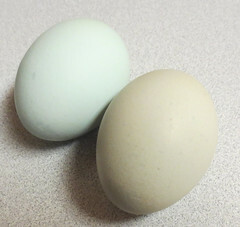 According the Wikipedia Barred Rocks chickens do lay large eggs but this one takes the blue ribbon in my opinion. I have never seen a chicken egg this big in my life. I am told it should be at least a double yoke egg and maybe even 3 yolks. My husband loves hard boiled eggs. I’m always boiling eggs for his lunch and sometimes they come out good and other times they don’t. Sometimes they won’t peel for anything. The shell sticks to the egg white and it turns into a big mess. You know what I mean if you’ve ever struggled with peeling a hard boiled egg that doesn’t want to peel. It’s miserable and you end up throwing most of the egg out. After experimenting with several different cooking methods, here is my recipe for hard boiling the perfect very fresh egg. Starting with cold water in a sauce pan, add a dash of salt. Add eggs to water in sauce pan. The water should be covering the eggs. Bring to boil and then turn off. Leave the pan on the burner and cover it. Leave on burner for 20 minutes. Remove and uncover the pan. But don’t pour out the water. 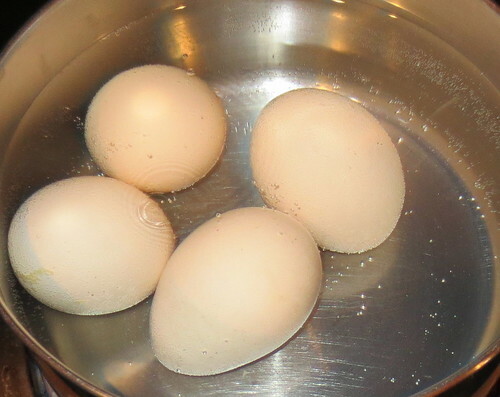 Leave eggs to cool in original water in the pan. 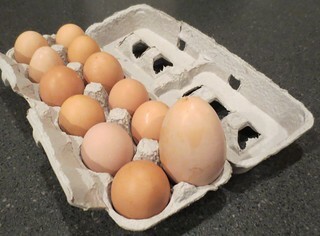 Once cooled, refrigerate the eggs. Conclusion: Perfectly cooked hard boiled eggs that usually peel easily. ETA: My eggs are very fresh and this method is designed for very fresh farm eggs.